A transport ship, whose passengers include an agent of the law transporting an extremely dangerous criminal to a new prison facility, crash-lands on a desert planet in a trinary system. The place seems deserted, but evidence of a civilization of sorts still exists. As the survivors of the crash - including the lawman and her charge - try to find a way to either repair their ship or send out a distress signal in order to get help, their numbers begin to dwindle through a series of mysterious disappearances. Everything points to the criminal having somehow found a way to slip his bounds and wreak havoc, but the crash survivors soon discover the relentlessly sunny planet harbors a secret at its darkened core, one that is about to escape its own prison and visit destruction upon them all. Pitch Black is significant on several fronts. First and foremost, it is one of the most engaging science-fiction/horror combinations since Alien first scared the bejesus out of people back in 1979. Pitch Black is also the film that first brought Vin Diesel to the attention of audiences; indeed, his portrayal of Riddick, the unrepentant criminal with the surgically-enhanced sense that proves vital to the survival of the crash survivors quickly becomes the focal point of the film. But as with all horror films, the money shot, as it were, is the monster, and the monsters that haunt this sun-baked planet are something to behold. 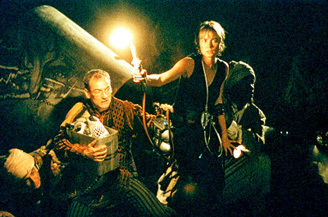 To speak too much on the how and why the beasties initially lie dormant would be to spoil the fun, but suffice it to say that David Twohy’s clever script and direction keep the audience from sussing out the situation too much before the film’s characters, if at all. And the final sequences, in which the monsters hold sway over the planet and its desperate human inhabitants, are gripping far beyond the usual who’s-monster-fodder-next suspense. Twohy takes the time to make us care about these people without spending too much time on the set-up, and the film gets to the metaphorical fireworks factory quickly enough to satisfy even the shortest of attention spans. With a sequel on the horizon, now is the perfect opportunity to catch up with a film that didn’t receive the recognition it deserved during its theatrical run, but has more than made up for that in the home video market. You’ll find it well worth the effort to meander down to your local DVD rental emporium and pick up a copy of this gripping SF/horror hybrid.